My parents had a meet-up with their classmates from Vietnam on Sunday night. The host had informed us ahead of time, that she would be getting duck eggs from an egg ranch by her place. Here in the US, it is commonly known as balut as it’s a delicacy in the Phillipines, but folks all over Southeast Asia have been long eating it. My father said it’s very nutritious and his mother apparently had it often back in Vietnam. Since both my parents had it in the past, I dared myself to try it, much to my dismay. The 15-day old duck eggs were kept in the fridge and boiled just before consumption. I watched the host’s husband eat it first, then I followed suit. I placed the egg on an egg stand, cracked the top of the egg with a spoon, peeled off the cracked part, ripped the membrane gently with the spoon, and slurped the juice. The juice itself was sweet. Then I scooped out the duck (mine was BIG and ugly; the pic below was the host’s husband’s which looked better) and left it on my spoon for a bit….until I could muster all the courage to eat it! I ate the duck with salt only, but I saw another person eat it with Vietnamese mint leaves. The result? It tasted like any other raw meat. The egg yolk tasted like chicken yolk. In the Philippines, balut eaters prefer salt and/or a chili, garlic and vinegar (white or coconut sap) mixture to season their eggs. The eggs are savored for their balance of textures and flavors; the broth surrounding the embryo is sipped from the egg before the shell is peeled, and the yolk and young chick inside can be eaten. All of the contents of the egg may be consumed, although the white may remain uneaten; depending on the age of the fertilized egg, the white may have an unappetizing cartilaginous toughness. In the Philippines, balut have recently entered haute cuisine by being served as appetizers in restaurants, cooked adobo style, fried in omelettes or even used as filling in baked pastries. In Vietnam, balut are eaten with a pinch of salt, lemon juice, plus ground pepper and Vietnamese mint leaves (southern Vietnamese style). In Cambodia, balut are eaten while still warm in the shell and are served with nothing more than a little garnish, which is usually a mixture of lime juice and ground pepper. Fertilized duck eggs are kept warm in the sun and stored in baskets to retain warmth. After nine days, the eggs are held to a light to reveal the embryo inside. Approximately eight days later the balut are ready to be cooked, sold, and eaten. Vendors sell cooked balut from buckets of sand (used to retain warmth) accompanied by small packets of salt. Uncooked balut are rarely sold in Southeast Asia. In the United States, Asian markets occasionally carry uncooked balut eggs. Alternatively, they can be mail-ordered. The cooking process is identical to that of hard-boiled chicken eggs, and baluts are eaten while still warm. The age of the egg before it can be cooked is a matter of local preference. In the Philippines, the ideal balut is 17 days old, at which point it is said to be balut sa puti (“wrapped in white”). The chick inside is not old enough to show its beak, feathers or claws, and the bones are undeveloped. 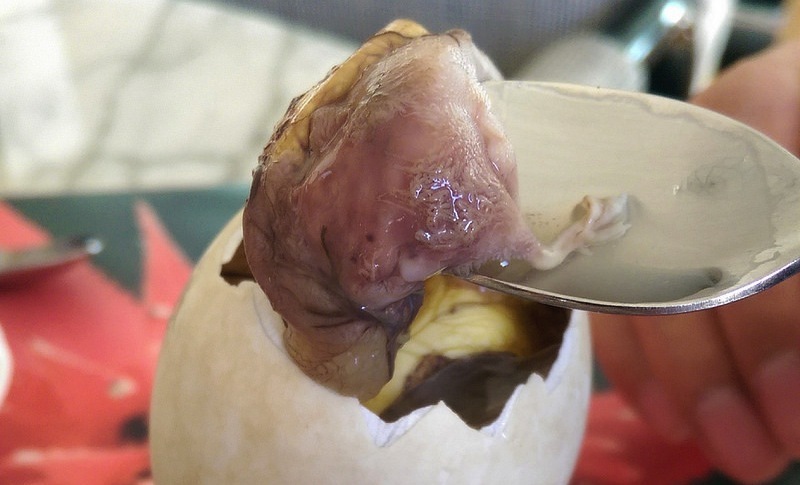 The Vietnamese often prefer their balut mature from 19 days up to 21 days, when the chick is old enough to be recognizable as a baby duck and has bones that will be firm but tender when cooked. Most eggs you buy in your local grocery are unfertilized eggs, produced by hens who don’t have access to roosters. Fertilized eggs rarely make it to market; egg sellers check them for the presence of an embryo by candling, a technique that illuminates the shell and makes it transparent. Fertilized duck eggs normally incubate for 28 days, while fertilized chicken eggs incubate for just 21 days. Balut eggs have incubated for a total of 18 days for duck eggs and 13 to 14 days for chicken eggs, according to the University of Kentucky Cooperative Extension. At this stage, the bones are soft enough to eat and the feathers haven’t yet developed. Unlike regular eggs, balut eggs fall under the category of an ethnic food. As such, they do not undergo the same inspections and grading that regular eggs undergo, according to the United States Department of Agriculture. You can purchased balut uncooked or already cooked. If they are not already cooked, hard-boil the eggs for 20 to 30 minutes before eating them. Hard cooking will kill any bacteria that might grow in the eggs during the incubation period. After hard-boiling, eat the balut directly from the shell. Eat balut while it is still warm. Don’t eat the shell itself. Look at the egg to see which end is larger, peel the top part of the shell, break through the membranes and sip the amniotic fluid liquid from the egg. The egg contains the duckling embryo, the egg yolk and the albumin. The yolk and embryo are completely edible. Many consider the albumin too tough to eat and discard it. Filipinos traditionally season the egg with salt, vinegar or soy sauce as they eat it. Discard the shell when you finish the inside ingredients. Although balut might not sound appealing if you haven’t grown up with it, it does make a nutritious snack, high in protein and calcium. A serving of balut contain 188 calories, including 14 grams each of protein and fat, 2 milligrams of iron and 116 milligrams of calcium. You don’t need an egg stand, just use the egg carton as egg holder, less clean up to do. Add the salt and pepper before slurping the juice give it more flavor. If you are not skill with eating it from the top, crack the egg and drop everything in a small bowl, less messy. Try tamarind saute’ balut, more flavor, better texture. I think you take the balut, boil it, open it up, quick fry in hot oil, then saute’ with tamarind sauce. I’ll try those methods next time! WOW! You’re so brave Serena! Do you think this is something you’ll eat over and over again? Would you cook it or is it simply something you’ll eat when you’re visiting your parent’s friends? I prolly would only eat it with friends, as I’d order more than one at a time and wouldn’t eat it everyday.